The term facelift can often be very confusing to patients. This is because there are many portions of the face that can be “lifted” (see Facial Aging section). In plastic surgery textbooks and in Dr. Steiger’s practice, the term facelift (rhytidectomy) generally refers to a “lift” of the lower one-third of the face and the neck. 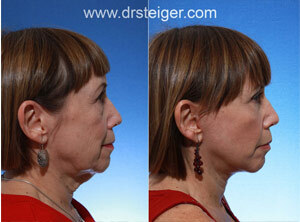 This is performed to correct sagging jowls and neck redundancy (double chin), which develop as we age. 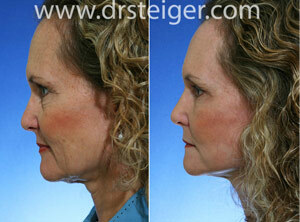 This procedure restores a youthful appearance by recreating a well-defined jaw line, smooth neck, and contoured cheek. No. There are many different methods/ surgical techniques for performing facelifts. The surgery performed by one physician is not necessarily the same as one performed by another. Most patients are not aware that there are many different ways in which a facelift can be performed. It was not too long ago when surgeons would perform facelifts by cutting out a portion of the skin and tightly sewing it back together. Unfortunately, this resulted in an unnatural “pulled” appearance, sometime called a “windswept” look. Modern techniques focus on repositioning the deeper facial tissue. This deeper tissue is called the SMAS, sometimes referred to as the “muscle layer.” Modern techniques vary based upon where and how the SMAS is treated. Newer techniques of performing facelifts in a deeper plane insure a nonsurgical natural appearance to the face. These techniques may also provide greater longevity than traditional facelift surgery. SMAS stands for the Superficial Muscular Aponeurotic System. This is the tissue layer that surrounds the deep tissue of the face and neck. The effects of aging and gravity results in sagging of the deep facial tissues. Since the SMAS surrounds all of these tissues, elevating the SMAS will restore your face to a more youthful position. What is the difference between facelift techniques? The type of lift performed makes all the difference. Basically, the surgical techniques vary by the types/length of the incisions, the direction in which the deep tissues are repositioned, the portions of the SMAS tightened, the direction of the lift, and whether or not the facial ligaments are released and repositioned. Can you describe some of these techniques? SMAS Facelift – This is a general term which refers to a technique in which the SMAS layer is lifted. In this type of lift, the SMAS is usually treated close to the ear and farthest away from the sagging tissues. Tissue elevation with this technique occurs furthest away from the jowel and sagging tissues, limiting the results. Extended SMAS – Facelift In this technique, the SMAS is lifted closest to the jowel and sagging tissues. The sagging ligaments of the jowel are restored to their more youthful positions. This ensures the most effective facelift results possible. 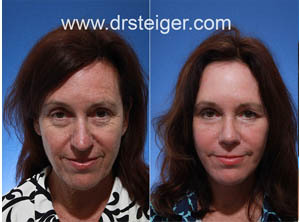 Dr. Steiger performs his SMAS lift in an almost vertical direction in order to produce a natural appearance. Deep Plane Facelift – This lift is similar to the extended SMAS facelift, but also includes elevation of the cheek fat (mid-face). The Deep Plane Facelift is the most comprehensive Facelift technique for repositioning the deep facial muscles and ligaments back to their more youthful position. 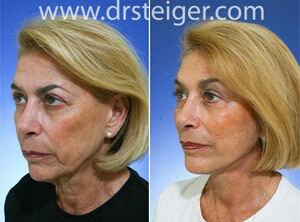 The Deep Plane Facelift lifts all of the major facial retaining ligaments up to their more youthful positions. This addresses the cheek, neck, and the jowl. This is of the most effective facelift techniques for achieving natural appearing and long lasting results. Vertical Facelift – The vertical lift is a revolutionary face lift technique where the deep tissue is elevated in a straight vertical direction. 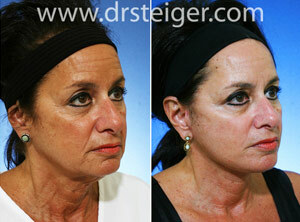 What type of facelift does Dr. Steiger perform? All of them! Aging, just like health, is significantly impacted by our unique genetic makeup and physical environment. This is what distinguishes us from each other, and is why we each age differently. During your detailed consultation, Dr. Steiger will evaluate your unique aging pattern in order to determine which type of lift will serve you best. As a plastic surgeon dedicated to the face, he is skilled with the most advanced techniques aimed to create a natural and more youthful appearance for you. What results can one expect after facelift surgery? A facelift is designed to treat the jowls and the neck. 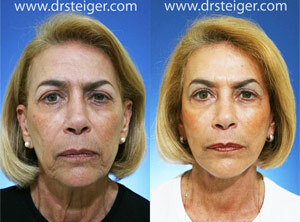 The deep plane facelift can also lift the midface as well. Click on this facelift results video to see a detailed explanation of before and after photos of a deep plane facelift surgery.